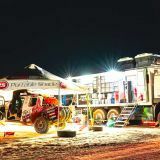 Dakar 2018 was turned on its head on Saturday to bring a new look to the leaderboard as the race pulled into the Bolivian Andes town of Uyuni. Mr Dakar, as they call him, Frenchman Stephane Peterhansel may have gone into the day’s stage with over an hour’s advantage over Peugeot teammate Carlos Sainz, but not only did the Spaniard win his second cross country stage on the trot, Peterhansel also hit troube early on to lose an almost two hours to drop down the field as he struggled to repair his damaged Peugeot. 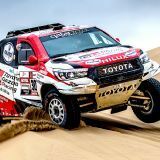 That allowed South Africa’s Giniel de Villier’s Gazoo Toyota South Africa Hilux into second place under pressure from teammate Nasser Al Attiyah in what had suddenly turned into a fight for second for the day and second overall too, as the Qatari hounded the man from Stellenbosch home. Dutchman Bernhard ten Brinke, who had led the Toyota charge in third as the day started, struggled after troubles earlier in the day as he trailed Pole Jakub Przygonski’s Mini, Czech driver Martin Prokop’s Ford and Argentine Lucio Alvarez, driving a Toyota with South African navigator Rob Howie home in seventh. 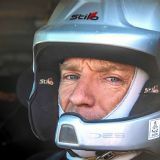 Ten Brinke was set to slip to fifth overall behind Peterhansel, both of them close enough behind Al Attiyah and de Villiers, who are now split by 9 minutes in second and third, but an hour and eleven behind leader Sainz. 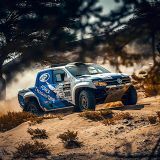 South African privateers, Hennie de Klerk and Gerhard Schutte had powered the TreasuryOne Amarok out of section 4 in 20th at the time of writing, closely followed by fellow rookie Valucíc as they continued their event-long battle at the head of the car rookie standings. Spain’s Joan Barreda was the first bike home for Honda, taking another stage win to come home two minutes 51 seconds clear of Yamaha-mounted Frenchman Adrien van Beveren. Argentine rider Kevin Benavides competed the day’s podium on another Honda, ahead of Aussie Toby Price’s KTM, Pablo Quintanilla on a Husqvarna and Matthias Walkner on another KTM. The overall bike race is developing into a thriller as Barreda continues to charge back from his earlier problems — he has closed his deficit to overall leader van Beveren down from being over 22 minutes adrift and 14th overall a week ago, to under 5 minutes as he moved into third. Van Beveren meanwhile retook the overall lead from Benavides at Uyuni today. Sunday’s Day 8 is the big one — not only will crews head straight into 500km of special on the second day of the marathon stage without the comfort of servicing their vehicles, but they face the extreme test of high-altitude sand dunes at some 3500m above sea level following an already sensational first half of the marathon stage on Saturday. 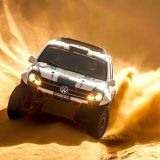 Follow Sunday's news as it breaks on TreasuryOne’s Dakar Live Blog at www.motorsportmedia.co.za. 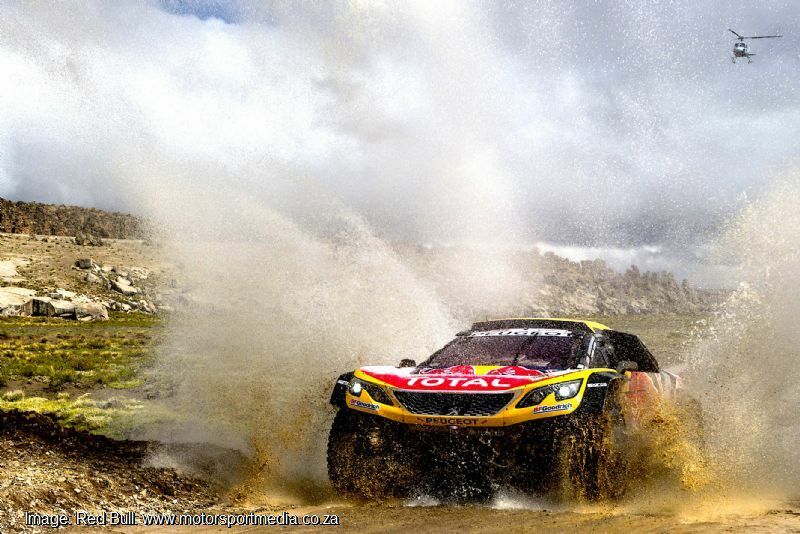 21:50 - cars: Sainz passes the final control 11 minutes cear of de Villiers, who is under pressure from Al Attiyah. 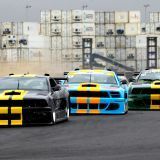 Behind them, Pole Jakub Przygonski’s Mini, sits fourth ahead of Czech driver Martin Prokop’s Ford and Argentine Lucio Alvares, driving with South African navigator Rob Howie, with Bernhard ten Brinke seventh after troubles earlier in the day in the third Toyota. 19h40 - bikes: Spain's Joan Barreda was the first bike home for Honda, 2 minutes 51 seconds ceaqr of Yamaha-mounted Frenchman Adrien van Beveren, Argentine rider Kevin Benavides on another Honda, Aussie Price's KTM, Pablo Quintanilla on a Husqvarna and Matthias Walkner on a KTM. The overall bike race is developing into a thriller as Barreda has closed his deficit to overall leader van Beveren down to under 5 minutes from being over 22 minutes adrift and 14th overall a week ago, as he moved into third behind Benavides. 19h30 - cars: Peterhansel was still ahead of Sainz out of sector 3 as de Villiers moves to third - Al Attiyah lost 19 minutes in the last sector, while Ten Brinke was slow through the last sector. 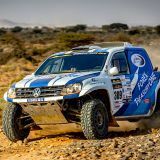 Hennie de Klerk is however having a good run in the TreasuryOne Amarok passing CP1 in 19th. 16h25 - bikes: Barreda leads van Beveren by 1:34 with Jager, Alakner, Svitko & Soultrait next up, while a group of regular frontrunners including Benavides, Price, Quintanilla, Guell and Meo appear to have lost time a similar amount of to run outside of the top 10 around 7 minutes off the pace after Sector 2. 15h25 - bikes: Barreda is charging again today - a minute quicker than the rest through CP1 he leads Walkner by a 47 seconds, Benavides, Price, Jager and Svitko. 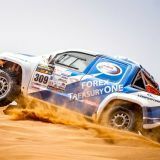 09h40 - cars: South African duo Hennie de Klerk and Gerhard Schutte were meanwhile running in 28th in class in the TreasuryOne Amarok embroiled in a battle for overall the rookie lead with Pole Boris Vacuík’s Ford at the time of writing. 09h30 - cars: Although it has lost one car and another sits way back in 48th essentially two days off the pce with its compounded penalties, Peugeot remains in complete control with with Stephane Peterhansel leading Carlos Sainz by 24 minutes and that delayed third car of Cyril Despres running protection in their shadows. 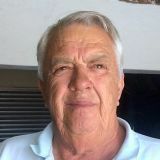 09h25 - bikes: South African riders David Thomas starts week 2 in 54th, Donavan van der Langeberg 64tt, Willem du Toit 65th and Gerrie van der Byl 101st. Sady Wessel Bosman opted not to continue Thursday morning following a brave effort toward the back of the bike field. 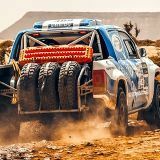 MADE IN SA TOYOTA WINS DAKAR! 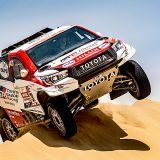 TOYOTA ON BRINK OF DAKAR VICTORY!